Rommie purveying the world outside: atop the cutler desk, one of his favourite spots. Koshka Silver Romenov aka Rommie, arrived into my life not long after I'd lost my beautiful Titch, my second Russian, who was with me for almost seven years. Feeling a lump on Titch's side, I took him to our vet, who after examination, telephoned with the tragic news that Titch had inoperable cancer. Animal lovers will empathise I'm sure, losing my beautiful boy was a death in the family. Though inconsolable at the time, I knew I had to get another Russian, and rang several breeders. Fortunately I was given Glynne Milburn's name and phone number, and rang her immediately. 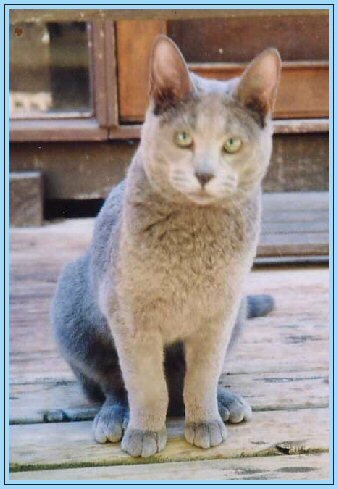 Alison and I went to the Koshka Cattery to meet Glynne, and several of her beautiful Blue's and Cornish Rex's. Amongst the Blue's was a delightful but slightly shy chap who very much resembled my Titch. 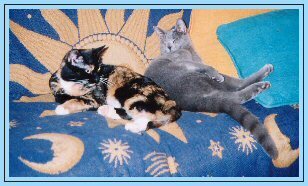 As luck would have it, Glynne was looking for a home for Rommie at the time and, as it's said, the rest is history. 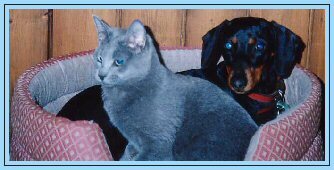 Our family now consists of Ella, the dachshund, Sadie the totally delightful tortie, and of course the magnificent Rommie, who I'm certain, understood the sadness I was overcoming, and became my constant companion from day one. As an aside, Rom has an untaught nightly ritual. At bedtime he jumps onto the bed to have a cuddle that can last from 10 to 15 minutes. Then with a quick lick of my hair he's off to his spot in the livingroom. 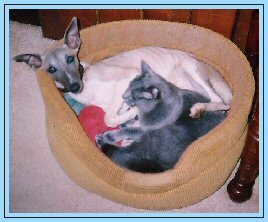 Cuddling up with Arnold the whippet, they were great mates. Unfortunately Arnold is no longer with us, he's now extremely happy in a household of several dogs. Ella the dachshund, and Rommie, sharing a moment together. Rommie adores Ella, rubbing against her at every opportunity. Sometimes Ella doesn't find this affection necessary and curls her lips back with, "back off Russian, or I'll nip you. Where else does one lie on a cold winters night, may we ask? 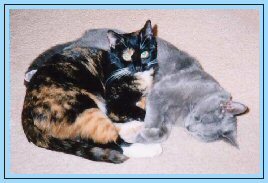 Living in the Dandenong Ranges, about 50 km from Melbourne, Victoria, where birds and small animals abound, we decided not to allow the natural instincts of our cats to hunt and kill. Natural it is, no matter how well fed and cared for. Consequently we've been complimented by our neighbours for having an enclosure built adjoining the house that they can enter anytime to enjoy the earth and sunlight. This restriction hasn't in any way effected their well being, in fact it's improved it. We are not rushing off to the vet regularly for costly repairs from post cat-fights over territory. A restrained or inside cat is a happy, healthy and safe cat. Also, sharing lives with animal friends brings a sense of responsibility. I'd find it difficult to live devoid of their companionship, also their unquestioned and unqualified love. 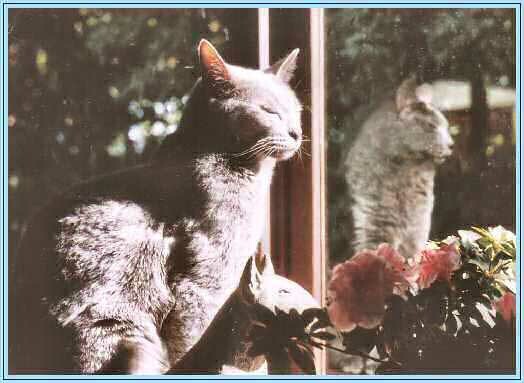 The Russian Blue is a very special breed, I couldn't imagine life without one. Thank you Glynne, for our Rommie.